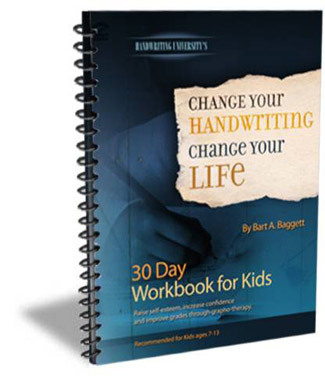 Raise your kids' grades and self-image through handwriting changes. that appeared in December's Family Life Magazine. This article helped reach the masses of teachers, parents, and people who otherwise might not give handwriting the "scientific" recognition it might otherwise get as a tool for improving memory, dexterity, spelling, and confidence. Perfect for kids grades 3-7th. Package includes workbook and 30-minute MP3 which you listen to via the internet. It takes about 5-10 minutes per day to complete Day 1 - Day 30. Change Your Life for Kids Journal for Kids. * Using the button above, you can add a Grapho-Deck for just $7.95. 50% savings. This book recommended for kids agest 4- 11 instead of the adult workbook because the middle zone lines are larger. If you do not own the Grapho-Deck or do not own any reference material about which handwriting traits to change, we recommend you consult a local Certified Handwriting Expert in Grapho-therapy or also purchase the book: Success Secrets of the Rich & Happy to get some insight. This book isprimarily used in classrooms taught by trained and certified handwriting experts. If you want to work WITH your children and really help them understand the personality traits of the journal, simply order this combination "KIT" which includes the Grapho-Deck Flash cards and it becomes a game of personality and more fun. Plus, you, the adult also have a 30 day journal. This saves you money and insures the child finishes the 30 days... because it is a team project. *Order extra kids book at this discounted price of $17.50 as part of the Teacher's Combo Kit. This is the best value. Save Over $30 if bought seperately. We include a Grapho-Deck with this course to easier explain the concepts to the children and help choose which three letters you will use during the month of journaling. Orders in multiples of 12 or more for teachers at the special rate of just $10 each. Use this button for wholesale order in units of 10 . Buy 12 Kid's Journals now at the Trainer's Discount of $10 each = $120. Available by faxing your order to 1-310-684-3489.